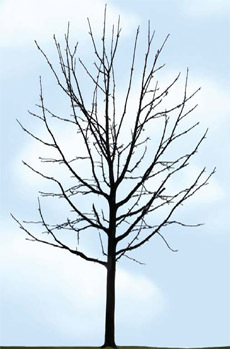 View the brochure showing how pruning type affects wind resistance in trees. We have prepared this site to assist you in locating current research and resources on storm damage risk and pruning. The site features recent research and is intended to act as a springboard for seeking out further information. This is a joint effort of the urban forestry and arboriculture programs at the University of Massachusetts and Virginia Tech and the urban horticulture program at Virginia Tech.. This site was initiated as part of a project sponsored by the USDA Forest Service upon the recommendation of the National Urban and Community Forestry Advisory Council. We are grateful for their support. Copyright 2007 Virginia Tech Forestry Department.